What happens when you put together drugs, racial tensions, an enormous cast of characters and a category four hurricane known as Hugo? You get Sister Santee, the newest novel by beloved writer Ken Burger. 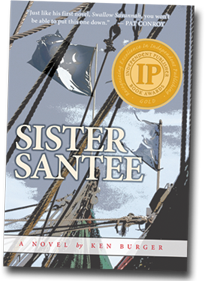 Sister Santee follows the story of Maceo Mazyck, Junior Jones, Berkeley Aiken and Stoney Sanders as they face the realities of life in the Southern post-Civil Rights era. Four disparate story lines & numerous other characters interact in a seemingly circuitous story. Once the groundwork is laid, however, each piece is fitted into the puzzle until the reader steps back at the last chapter to see the finished picture. And my, what a glorious picture it is. To these four disparate story lines, Mr. Burger throws in numerous other characters, each of whom interacts with one or more of the main characters in a seemingly chaotic story web. Once the groundwork is laid, however, each piece is fitted into the puzzle until the reader steps back at the last chapter to see the finished picture. And my, what a glorious picture Mr. Burger has painted for us.